This is our first card for the All Occasion Stack Class this week!! We will be making 12 cards - 4 of three different designs. I have designed them with no greetings to increase their versatility and have also used a variety of dies and papers to make all the cards different even if they all use the same sketch. 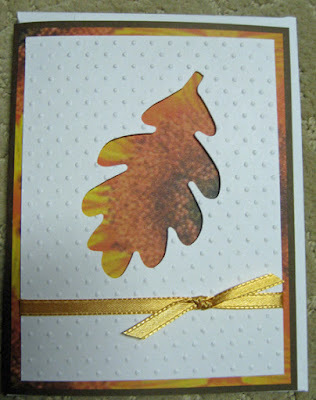 For this card I used an oak leaf die which is part of a large Sizzix die which requires smaller cutting plates (broken pieces) and precise placement as to cut the one die in this large layer. 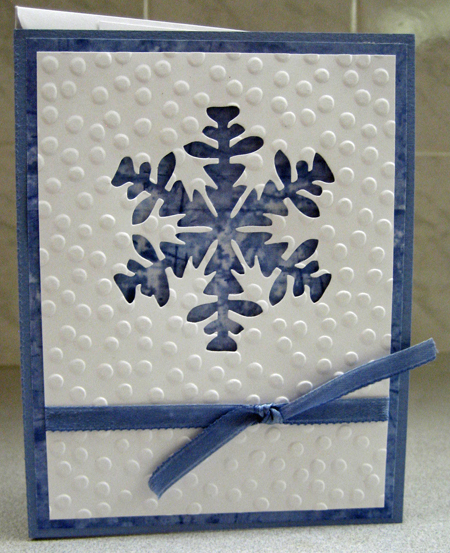 After cutting out the leaf I embossed the white layer (3.75" x 5") using the CB Swiss Dot embossing folder. I added a length of coordinating ribbon just below the opening adhering both ends to the back and tied on a short piece using a single knot to the one on the front to simulate a bow. I glued my decorative paper (4 " 5.25") to the front of a brown card and then mounted my embossed/die cut layer over it using 3D foam tape near the edges of the opening and double sided tape near the outside edges. Gives the opening some dimension!!! So in the course of making the kits I used a variety of dies - hearts, stars, snowflake, trees, bee, butterfly, flowers, etc to ensure a good variety of cards.